Want to add some sparkle to your bridal ensemble? These beaded edge wedding veils will do just that! Affordable Elegance Bridal has a wide selection of veils with dazzling beaded edges - in all lengths and styles - just perfect for your wedding day. 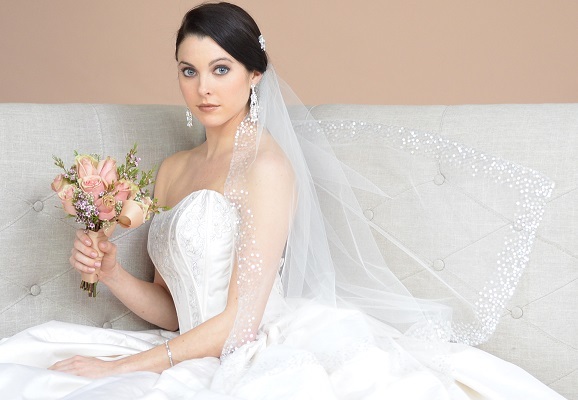 We have beautiful beaded veil selections from Elegance by Carbonneau, LC Bridal, Mariell, JL Johnson Bridal, Ansonia Bridal, Elena Designs, enVogue and Symphony Bridal. Need help choosing the right veil? Just contact us and we'll be happy to help.